Masami Saionji was just eighteen, now close to sixty years ago, when she found her calling. 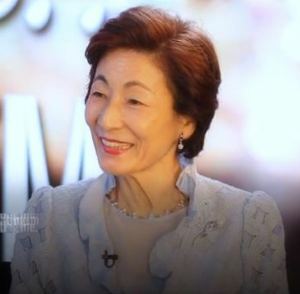 Born in the same year that World War II started, Masami remembers hearing Tokyo air-raids when she was 4 years old. Then, the atomic bombs on Hiroshima and Nagasaki where “bodies and objects were burned so black that people could not even bear to look at them.” Growing up as a descendant of the Royal Ryuku Family of Okinawa, she led a somewhat sheltered life – until she was eighteen. In fulfilling her longing to visit her ancestral town, she walked into Himeyuri Monument that was built in memory of army nurses – who had committed mass suicide in fear of an army invasion. And she found her life’s calling: use the power of prayer to heal yourself, and the world. Masami Saionji has dedicated the last sixty year of her life to that pursuit. If I had to characterize Masami’s work in one phrase, it would be this: subtle service. Simple on the outside, deep on the inside. The simplicity makes it accessible to everyone, and the depth gives wings to its ripples. One of the first projects she started was planting of peace poles – a physical pole, with “May Peace Prevail on Earth” inscribed on all four sides. It was to fulfill Goi Sensei’s wish that Japan becomes a vehicle for global peace. “In our world, with so much conflict, strife, poverty, hunger, disease, and discrimination, we can lose sight of our sacred nature. But we hope that when people see a peace pole, they have an opportunity to reconnect with their divinity, even if just for a moment.” More than 250,000 peace poles – from Vatican to UN, from hospitals to churches, from neighborhood parks to backyards – have been planted around the globe, and it has catalyzed a much-needed unifying narrative. Another practice, that she herself does to this day, is writing prayers of peace and mandalas of gratitude. Almost three years ago, I remember walking into this prayer room – without too much context at that time – and feeling the richly dense presence of goodness. Now I know why. That room has been host to more than a million hand-written prayers (each accompanied with a minute of silence) for each country in the world, in every major language spoken in those parts of world. More continue everyday. 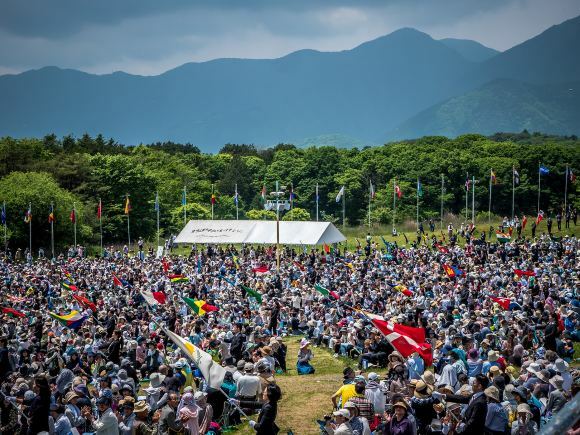 Moreover, rain or shine, snow or sun, members of Byakko Shinko Kai (the prayer group that Masami leads) show up on a giant field every month to pray for peace. All around that field are flags of every single country in the field. Their universal prayer is the same: May Peace Prevail on Earth. If there is conflict in two regions of the world, they will localize the prayer. “May Peace Prevail in Israel. May Peace Prevail in Palestine.” And it’ll be said out loud in the native tongue of that country. “Our personal happiness and peace of the world are linked together. Neither can exist without the other,” Masami says. To promote that universal spirit, they hold an annual “Symphony of Peace Prayers” at their Fuji Sanctuary (at the base of Mount Fuji). This year, during the three hour program, many thousands of people quietly assembled outdoors. Religious leaders from different faith traditions around the world shared their prayers for peace, and everyone whole-heartedly joined in. Additionally, a tea master performed a world peace ritual, artists offered music for peace, children performed a dance, and local spiritual groups shared their practices. Everyone was remarkably quiet, and it very much felt like a collective peace prayer. Towards the end, there was a moving flag ceremony – where every flag of every single country was mindfully brought out as we all recited “May Peace Prevail in [Country]” in the native language of that country, complete with phonetic pronunciations. 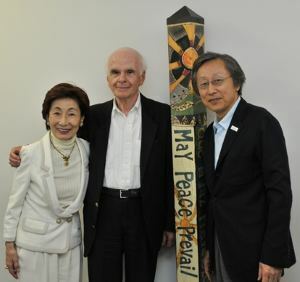 On this special day, with her husband Hiroo (who does deeply related work with Goi Peace Foundation) and renowned thinker Ervin Lazlo, they also unveiled the “Fuji Declaration”. With the continual hope of bringing people together, the Fuji Declaration lays out a new design principle across all disciplines of work – that we are unified in the field of consciousness. In many ways, it is a culmination of their life-long work. Masami describes it like this, “We have relied on our leaders for too long, but now, the world requires each one of our innate divine sparks to be illuminated, so it can unleash a great creative wave. Unknowingly, we have attached ourselves to certain limited ideas, and we keep reinforcing them out of habit -- but it is now time for us to exert our own intrinsic, sacred consciousness. To join in, simply listen to your intuition and take that first step. One small step is all it takes. Once you have taken that first step, your divine intuition will continue to guide you." What I like most about the Fuji Declaration, and all their work, is that they are not trying to hold it all into a particular organization, or brand. It’s simply an invitation to ignite our divine spark, co-create in the universal field and rebuild the commons of humanity. Yuka Saionji Matsuura, Masami’s youngest daughter, was actually our introduction to this incredible ecosystem. Masami, her husband Hiroo, their daughters Maki, Rika and Yuka are all dedicated to this work. Full-time, and over-time. What strikes me most, though, is their humility. Everything about them is light. Surely, they are prominent leaders, with big influence, and yet they are constantly thanking others, serving others, laddering others. Moreover, they don’t fundraise or market their work, on principle, with the idea that nature will pull in those who need to be pulled in. On my last trip, I was pulled in by an unsuspecting fellow -- Yuka’s driver. I couldn’t catch his full name, so I just called him Mr. T. He didn’t speak much English, and I only know how to say “arigato” in Japanese, so our conversations usually comprised of unending smiles, big hugs, and half-bows. Although known to climb up and down Mount Fuji in one day, his strength seems to stem from a different source. 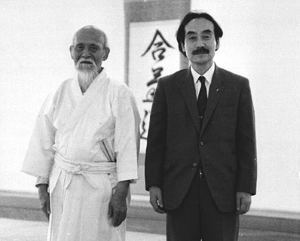 En route to an audience with the great grandson of Aikido founder (Morihei Ueshiba), I learned that Goi Sensei and Ueshiba Sensei were spiritual kin. When Ueshiba Sensei was in his ninetees, Goi Sensei sent him a message: “If you would like to practice your form one last time, I would be happy to support.” Ueshiba Sensei, although immobile and unable to climb the stairs, agreed. 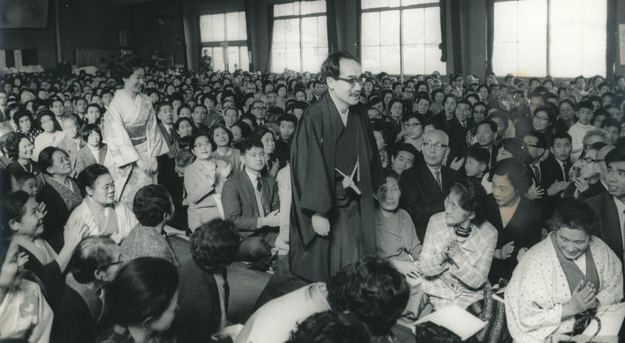 While Goi Sensei and Masami prayed in the room, Ueshiba Sensei entered into his uniform, bowed, and swirled around the room with an other-worldly energy. As he concluded, he bowed with an affectionate reverence. Soon after, he left his body. Sure enough, it was none other than Mr. T who had carried Ueshiba up the stairs that day! One could see such everyday heroes all around this Fuji Sanctuary. At one point in the ceremony, I spotted a volunteer doing some heavy coordination to manage the crowds. In between chores, he had three seconds to spare and he started reciting prayers with everyone else. As we were getting off our bus, another volunteer didn’t just unload our bags, but pulled out the stowing handle bar so we can roll it out easily. Similarly, when we walked into the prayer hall at the Fuji Sanctuary, we customarily took off our shoes. Of course, everyone left them outside unevenly, but I noticed that one of the volunteers was straightening them up. Not only that, but she re-oriented the shoes facing out, so when we walk out, we can easily slip into them. It was truly a labor of love, in every visible direction. As our group was departing and boarding the bus, several dozen staff and volunteers were waving with both hands. It wasn’t just that they were waving, but you could feel their sincere gratitude. Odd thing is that they were the givers, and yet they were ones who were grateful. To me, this seems to be the most important reminder of the Fuji Declaration – that it takes all our diverse expressions of oneness to create a thriving world. It takes Masami, but also Yuka and also Mr. T. It takes the three second chant by a logistics coordinator, it takes the shoe-arranger, it takes the bag unloaders, it takes the bus wavers. It takes everyone’s divine spark.